Each membership star represents one year of registration as a Girl Scout. Place stars* on this disc, directly beneath the troop/group numerals on the right side of the vest or tunic, from right to left in the following order: Girl Scout Daisy stars (on BLUE disc), then Girl Scout Brownie stars (on GREEN discs), Girl Scout Junior stars (on YELLOW discs), Girl Scout Cadette stars (on WHITE discs), Girl Scout Senior stars (on RED discs), and Girl Scout Ambassador stars (on NAVY discs). 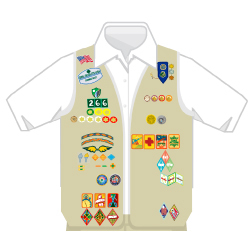 *Girl Scout Membership Stars (item 09600) are sold separately. This item is sold in packages of 24 pieces.